Gerashchenko B.I., Ryabchenko N.M., Glavin O.A., Rodionova N.K., Makovetska L.I., Ganzha O.B., Druzhyna M.O., Mikhailenko V.M. Summary. Aim: The purpose of this study is to test whether whole-body fractionated exposure of tumor-free animals to low doses of low-LET radiation (at the total delivered dose of 1.0 Gy of X-rays) is capable of potentiating growth of subsequently implanted tumor cells. Materials and Methods: Adult male rats were fractionally exposed to low doses of X-rays (10 acute exposures with 0.1 Gy each and with a frequency of 1 exposure per 3 days). The next day after the last irradiation rats were implanted with Guerin carcinoma (GC) cells. On the 12th and 18th days after implantation of GC cells, animals were sacrificed, and the mass of tumors was measured by weighing them, although the kinetics of tumor growth was also examined by daily measurements of the dimensions of tumors. Cytotoxic effects in the bone marrow were assessed flow cytometrically in acridine orange-stained unfractionated bone marrow cells using the ratio of polychromatic erythrocytes (PCE) to normochromatic erythrocytes (NCE). Results: In irradiated rats, tumors grew apparently faster than in unirradiated rats for up to 18 days after implantation of GC cells. On the 18th day after implantation of GC cells the average value of the mass of tumors in irradiated rats was 2.8-fold higher compared with the average value of the mass of tumors in unirradiated rats (p < 0.05). On this day post-implantation, the bone marrow in irradiated animals was 1.8-fold more suppressed (as evidenced by decreased PCE/NCE ratios) than that in animals that were irradiated, but were not implanted with GC cells (p > 0.05), and was 1.4-fold more suppressed than that in animals that were not irradiated, but were implanted with GC cells (p > 0.05). Conclusion: Fractionated irradiation of tumor-free animals with low doses of X-rays potentiates proliferation of subsequently implanted GC cells. This potentiation seems to be associated with radiation-induced impaired hematopoiesis. Abbreviations used: IR — ionizing radiation; GC − Guerin carcinoma; LET — linear energy transfer; NCE − normochromatic erythrocytes; NK − natural killer; PCE − polychromatic erythrocytes; WBE − whole-body exposure. While high doses of ionizing radiation (IR) apparently induce deleterious biological effects including cancer, the situation with low doses of IR is much less clear. Curiously, acute or chronic whole-body exposures (WBE) to low doses of low-LET radiation (X- or γ-rays) have been reported to modulate the anti-tumor effect for some tumors in human  and in laboratory animals as well [2−5]. In experiments with animals (mainly rodents), this effect has been shown to take place if irradiations were performed before and/or after implantation of tumor cells [2−5]. Single or fractionated low-dose irradiations at the total absorbed dose of much less than 1.0 Gy are likely to stimulate the anti-tumor immune surveillance . Activated cytotoxic cells such as natural killer (NK) lymphocytes and macrophages may participate in this process . A dose of about 1.0 Gy seems to be critical for proper function of immune surveillance machinery due to high sensitivity of immune cells to IR. Nevertheless, Nowosielska et al. showed anti-neoplastic and immunostimulatory effects of fractionated WBE of mice with a total dose of 1.0 Gy (10 daily irradiations with 0.1 Gy of X-rays), and these effects did not much differ from those of fractionated WBE of mice with total doses of 0.1 and 0.2 Gy (10 daily irradiations with 0.01 and 0.02 Gy of X-rays, respectively). In their study, after irradiations, relatively radiosensitive BALB/c mice were intravenously injected with L1 sarcoma cells and sacrificed 14 days later for counting of neoplastic colonies in the lungs. Additionally, NK cell-enriched splenocytes and activated peritoneal macrophages (Mφ) were examined for cytotoxic activities against susceptible tumor targets. Perhaps, splitting a higher dose (1.0 Gy) into smaller portions may still stimulate immune cells. It is less likely that this effect would be seen if a single dose of 1.0 Gy is delivered acutely. Fractionated (multiple acute) or protracted WBE are believed to be less toxic than a single acute exposure if total absorbed doses are equal. The tumor promoting effect, however, was observed in our experimental model depicted in Fig. 1. After fractionated WBE of rats with a total dose of 1.0 Gy of X-rays (1 acute 0.1 Gy-exposure per 3 days with the dose rate of 0.89 Gy/min), there was accelerated growth of Guerin carcinoma (GC; uterine adenocarcinoma of rats, also known as T8 tumor), whose cells were subcutaneously implanted on the next day after completion of last irradiation. On the 18th day after implantation of GC cells the average value of the mass of tumors in irradiated rats was 2.8-fold higher than the average value of the mass of tumors from unirradiated rats (p < 0.05; Fig. 2), while on the 12th day post-implantation the gain of tumor weight in irradiated animals was 1.3-fold greater than the gain of tumor weight in unirradiated ones (p > 0.05; Fig. 2). In general, the tumor weight data correlated well with the tumor volume data. On the 12th and 18th day post-implantation, the average tumor volumes in irradiated animals were accordingly 1.4- and 2.4-fold larger than the average tumor volumes in unirradiated animals on these days post-implantation (p < 0.05; Fig. 3). Fig. 1. Schematic representation of the experiment. Adult random-bred male rats (140−160 g) were subdivided into 4 groups: 1) the group of animals that were subjected to fractio­nated WBE of X-rays at the dose rate of 0.89 Gy/min (10 acute exposures with 0.1 Gy each and with a frequency of 1 exposure per 3 days), but were not implanted with tumor cells; 2) the group of animals that were subjected to fractionated WBE with X-rays followed by subcutaneous injection (dorsally into the left flank) of 2.2 × 106 GC cells; 3) the group of animals that were not irradiated, but were implanted with tumor cells; 4) the group of animals that were neither irradiated nor implanted with tumor cells (intact control). On the 12th and 18th days after implantation animals were sacrificed, and tumors attached to the inner side of the skin were removed and weighed. At the same time, the femurs (from one leg) were also removed for bone marrow isolation. Cytotoxic effects in the bone marrow were assessed flow cytometrically in acridine orange-stained unfractionated bone marrow cells using the PCE/NCE ratio in accordance with the published protocol . The study with rats was performed according to the rules of Ethics Committee. This tumor promoting effect occurred even though irradiations were less frequent (1 exposure per 3 days) than in the aforementioned study (i.e., daily ). Although in our study the function of immune cells was not examined, something interesting occurred in the bone marrow, which is a major supplier of immune cells. Fractionated WBE alone did cause some bone marrow suppression (decreased PCE/NCE ratios), which was insignificant and persisted for up to 18 days post-irradiation (p > 0.05, if compared with controls; Fig. 4). 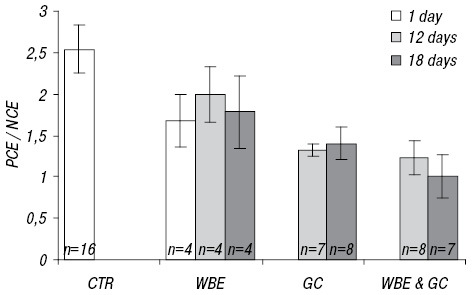 Perhaps, the reason why this effect was insignificant is in the low number of animals in WBE groups (n = 4). GC alone, however, was even more myelotoxic than fractionated WBE (p < 0.05, if compared with controls; Fig. 4), suggesting the role of long-range signaling in this effect . 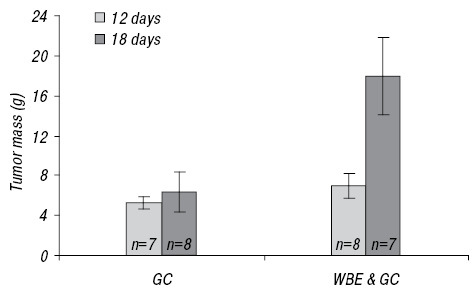 The combination of GC with WBE caused further enhancement of bone marrow suppression with reaching the lowest PCE/NCE ratio on the 18th day post-implantation (p < 0.05, if compared with controls; Fig. 4). 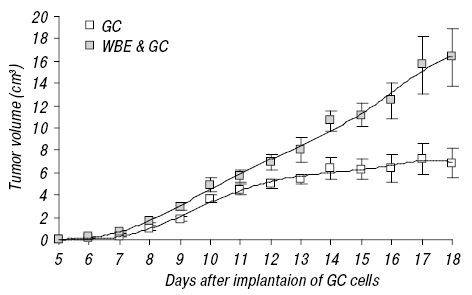 On this day post-implantation, the bone marrow in irradiated animals was 1.8-fold more suppressed than that in animals that were irradiated, but were not implanted with GC cells (p > 0.05; Fig.4), and was 1.4-fold more suppressed than that in animals that were not irradiated, but were implanted with GC cells (p > 0.05; Fig. 4). It should be mentioned that on the 18th day post-implantation, irradiated animals showed the highest gain of tumor mass and volume (Fig. 2 and 3). Thus, it does seem that potentiation of tumor growth after fractiona­ted WBE somehow is associated with radiation-induced impaired hematopoiesis. To define whether impaired hematopoiesis is attributable for this potentiation, further investigations are needed. Hematopoietic cells could yet be sensitive in terms of decreased survival or delayed proliferation to acute or protracted low-LET radiation down to the dose of 1.0 Gy [11, 12]. They express a p53-dependent cell cycle G1-phase arrest or p53-dependent apoptosis in response to a variety of stress stimuli. In CBA/Ca mice, resistant to radiation-induced myeloid leukemia and to radiation-induced chromosomal instability in the bone marrow, acute doses of ≥ 0.1 Gy of X-rays induced an increase of proportion of p53- and p21-positive bone marrow cells, while doses of ≥ 0.2 Gy also induced an increase of proportion of Caspase-3- and TUNEL-positive cells, a finding indicative of apoptosis . As with the dose of 1.0 Gy, this dose in the bone marrow induced delayed (persisted at least for up to 30 days post-irradiation) cytogenetic abnormalities . In another study with relatively radioresistant C57BL/6 mice, a total absorbed dose of 0.5 Gy of X-rays after single or fractionated (10 daily irradiations with 0.05 Gy) WBE resulted in DNA double-strand breaks in thymus cells (as evidenced by accumulation of γH2AX foci) accompanied by a significant decrease in global DNA methylation and histone H4-Lys20 trimethylation . In mice of this strain (C57BL/6), like in CBA/Ca mice, accumulation of Caspase-3- and TUNEL-positive cells in the bone marrow was obvious at doses of ≥ 0.2 Gy . It should be noted that in our study the tumor grew subcutaneously, while in the study by Nowosielska et al. tumor cells were directly injected into the bloodstream, whose colonies were then seen in the lungs. Since in the latter study tumor cells were much more accessible to immune cells, accordingly, they had more opportunity to be eliminated. However, this fact alone does not provide with a complete explanation of opposite effects observed in these studies. A possible explanation is as follows. While a tumor progresses, its hypoxic areas preferably accumulate tumor-associated macrophages of M2 phenotype . Contrary to M1 macrophages, M2 macrophages are pro-tumor that promote tumor growth, invasion and angiogenesis . They are also known as immune suppressive macrophages. Perhaps, in our experimental model, in which tumor cells grew in excess of hypoxia, pro-tumor activity of these macrophages somehow is enhanced after fractionated low-dose WBE. We also speculate that this mode of WBE can facilitate polarization of macrophages towards M2 phenotype after tumor cells were implanted. 1. Safwat A. The role of low-dose total body irradiation in treatment of non-Hodgkin’s lymphoma: A new look at an old method. Radiother Oncol 2000; 56: 1−8. 2. Anderson RE, Tokuda S, Williams WL, et al. 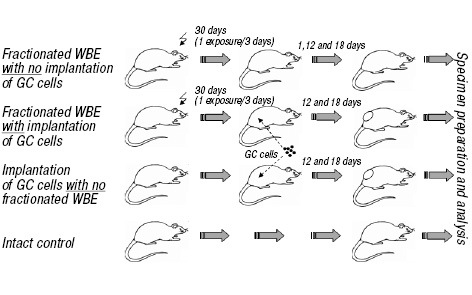 Radiation-induced augmentation of the response of A/J mice to SaI tumor cells. Am J Pathol 1982; 108: 24−37. 3. Hosoi Y, Sakamoto K. Suppressive effect of low dose total body irradiation on lung metastasis: Dose dependency and effective period. Radiother Oncol 1993; 26: 177−9. 4. Hashimoto S, Shirato H, Hosokawa M, et al. The suppression of metastases and the change in host immune response after low-dose total-body irradiation in tumor-bearing rats. Radiat Res 1999; 151: 717−24. 5. Mitchel REJ, Jackson JS, Morrison DP, et al. Low doses of radiation increase the latency of spontaneous lymphomas and spinal osteosarcomas in cancer-prone, radiation-sensitive Trp53 heterozygous mice. Radiat Res 2003; 159: 320−7. 6. Nowosielska EM, Cheda A, Wrembel-Wargocka, et al. Immunological mechanism of the low-dose radiation-induced suppression of cancer metastasis in a mouse model. Dose-Response 2010; 8: 209−26. 7. Nowosielska EM, Cheda A, Wrembel-Wargocka, et al. Stimulation of the natural anti-tumor cells by single and fractionated irradiations of mice with low doses of X-rays. Health Phys 2011; 100: 283−285. 8. Nowosielska EM, Cheda A, Wrembel-Wargocka, et al. Anti-neoplastic and immunostimulatory effects of low-dose X-ray fractions in mice. Int J Radiat Biol 2011; 87: 202−212. 9. Criswell KA, Krishna G, Zielinski D, et al. Use of acridine orange in: fow cytometric evaluation of erythropoietic cytotoxicity. Mutat Res 1998; 414: 49−61. 10. Gerashchenko BI, Ryabchenko NM, Glavin OA, et al. The long-range cytotoxic effect in tumor-bearing animals. Exp Oncol 2012; 34: 34−7. 11. Comas FV. The radiosensitivity of rat bone-marrow cells. Int J Radiat Biol 1970; 17: 549−57. 12. Yagunov AS, Tokalov SV, Chukhlovin AB, et al. Animal studies of residual hematopoietic and immune system injury from low dose/low dose rate radiation and heavy metals. AFRRI Contract Report 98−3. Armed Forces Radiobiology Research Institute, Bethesda, Maryland, USA; 1998. 13. Zyuzikov NA, Coates PJ, Lorimore SA, at al. Low dose responses of bone marrow to X-rays in vivo. In: Mothersill CE, Korogodina V, Seymour CB. Radiobiology and environmental security (NATO Science for Peace and Security Series — C: Environmental Security). Springer, 2012: 141−51. 14. Pogribny I, Koturbash I, Tryndyak V, et al. Fractionated low-dose radiation exposure leads to accumulation of DNA damage and profound alterations in DNA and histone methy­lation in the murine thymus. Mol Cancer Res 2005; 3: 553−61. 15. Lewis C, Murdoch C. Macrophage responses to hypoxia: implications for tumor progression and anti-cancer therapies. Am J Pathol 2005; 167: 627−35. 16. Solinas G, Germano G, Mantovani A, at al. Tumor-associated macrophages (TAM) as major players of the cancer-related inflammation. J Leukoc Biol 2009; 86: 1065−73.